There is something about music that seems to bring people together. On Oct. 3, it did just that, as almost 700 musicians from across Harlingen CISD took the field at Boggus Stadium for the second annual Band Night. Bands from HCISD’s five middle schools and two comprehensive high schools showcased their musical abilities in a spectacular celebration of music education. 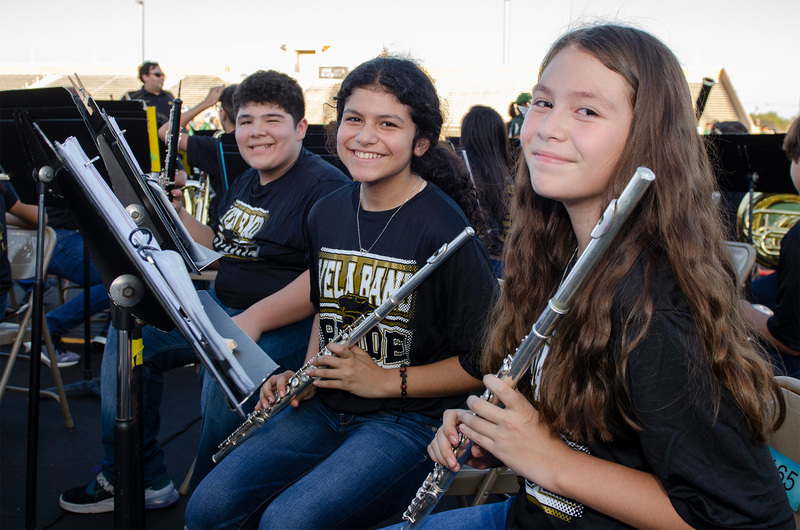 This event is an opportunity for high-school students to show off their UIL marching shows that they’ve been meticulously fine-tuning since the summer months and inspiring the younger generation to follow in their footsteps. For middle-school students, it is a sneak peek of what it’s like to be part of a high-school marching band and feeling the thrill of performance while hundreds of spectators are watching. There is much to be said about the benefits of music education. Aside from the accolades and joy of competition, learning music allows students to tap into multiple skill sets simultaneously. In May 2018, HCISD received the Best Communities for Music Education designation from The NAMM Foundation for its outstanding commitment to music education. Each year, in addition to TMEA and UIL events, HCISD ensembles participate in Region, Area, State, National & International competitive events. And, each year HCISD proudly produces outstanding results with students attaining awards at the highest levels of performance. Driven by the district’s success in music education, HCISD took on the ambitious task of launching a new learning experience with a focus on the arts beginning in the 2018-2019 school year – Lee Means Elementary Fine Arts Academy.